The Terry Fox Research Institute has chosen a key date in Canadian history to launch a national network to bring together leading cancer hospitals and research universities. 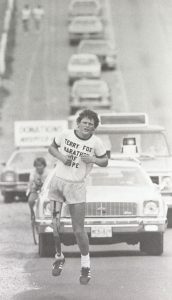 The announcement in Newfoundland comes exactly 39 years after Fox dipped his artificial leg in St. John’s harbour to begin his Marathon of Hope. The institute says the Marathon of Hope Cancer Centres Network will be the Team Canada of cancer research and will help accelerate so-called precision medicine for cancer patients. President Dr. Victor Ling says the network will apply new technologies, advanced imaging and artificial intelligence to ensure cancer patients across the country have access to the care they need.